PITTSBURGH, September 15, 2016 3BL Media Humanscale, Bureo, Owens Corning and Garden Tower Project have received Living Product certification for new and redesigned products that meet the high bar of the Living Product Challenge. The challenge is to design and manufacture products that function as elegantly and efficiently as anything found in the natural world. Turning inspiration into action, these forward-thinking companies were awarded new certifications at the second annual Living Product Expo, hosted by the International Living Future Institute September 13-15, 2016, in Pittsburgh. The challenge is to design and manufacture products that function as elegantly and efficiently as anything found in the natural world. Garden Tower is committed to socially-responsible practices at every level, and has a mission to help transform the face of gardening and food sustainability. The uniquely designed composting Garden Tower allows for the growing of a large variety of food in a very small space. 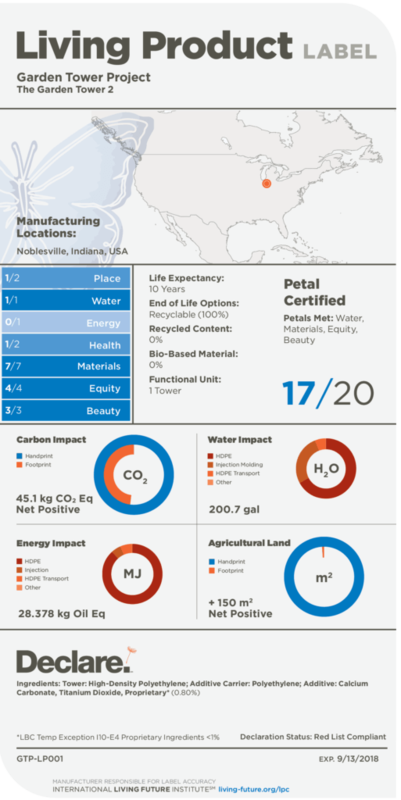 The product has achieved Petal Certification for Water and Materials, and the company is currently implementing a new low-carbon, bio-based plastic, a first for its product category. The Humanscale Smart® Chair is an ergonomically designed commercial desk chair that required a significant redesign on the path to Living Product Certification. Often, commercial office chairs are covered with fabrics that contain perfluorinated compounds. These chemicals, according to the National Institutes of Health, contribute to the body burden of toxicity and have a several year half-life, which means that the time it takes for the chemicals to leave the body can be several years. Humanscale has eliminated perfluorinated compounds from the redesigned Smart® Chair, which is manufactured in a solar powered facility with a newly installed rainwater collection system that offsets the water used in production. The Float Table is an innovative sit/stand desk that ‘floats’ effortlessly when you push a small lever, contributing to an ergonomically superior sit/stand work experience. Humanscale removed PVC from the product — a material with significant lifecycle health concerns — and is working to ensure the remaining product ingredients are fully optimized and safe for humans and the environment. The product is manufactured in a process powered by 100% renewable energy onsite. “The lifecycle health benefits of using this product versus traditional tables is massively positive when compared to the potential health consequences of tradition design and production,” said Connelly. “Both newly-certified Humanscale products are not only Net Positive for Water and Energy onsite – but we have conducted a rigorous LCA on each product and are now working to create Energy, Water and Carbon Handprints greater than the footprint of each product,” said Jane Abernethy, Humanscale’s sustainability officer. “We are increasing our handprint by switching to recycled nylon made from fishing nets from Bureo, teaming up with Kohler and an NGO to supply Clarity water filters, and providing water heater blankets to school children.” The practice of Handprinting refers to the measurement of positive impacts that a company makes compared to business as usual in addition to reducing their environmental footprint. Learn more about Humanscale. Bureo is a unique company designed around the concept of net positive, and its first product was a skateboard made of recycled fishing nets from coastal artisanal fishing communities. Bureo has been widely recognized for ingenuity in design and sourcing, with investors including the Patagonia $20 Million and Change Fund. Bureo has achieved Living Product Petal Certification for Water and Materials for its Net+Positiva Plastic, recycled plastic resin and pellets which they source from fishing nets, and which they intend to sell to other consumer goods companies to scale up their business. With EcoTouch® unfaced fiberglass insulation, Owens Corning achieves its second Living Product Imperative Certification for a product that reflects the company’s long-term commitment to sustainability. EcoTouch® is a residential and commercial insulation product that is certified to include a minimum of 65% total recycled content, and is GREENGUARD validated to be formaldehyde free. The Living Product Challenge reimagines the design and construction of products to function as elegantly and efficiently as anything found in the natural world. The creation of this program kicked off a groundbreaking new event that brought together leading minds in the product industry to inspire a revolution in the way materials are designed, manufactured and delivered: the Living Product Expo. The Living Product Challenge reimagines the design and construction of products to function as elegantly and efficiently as anything found in the natural world. At the first event in 2015 sustainability directors from the world’s leading design firms, prominent manufacturers and sustainability consultants learned about and shared game-changing innovations in product design. This second annual event moves from inspiration to action. The Expo is an opportunity for participants to share and discover disruptive new ideas and technologies that are reshaping the materials landscape, accelerating the pace of innovation and making Living Products possible today. The International Living Future Institute is an inspiring hub for visionary programs. Our mission is to lead and support the transformation toward communities that are socially just, culturally rich and ecologically restorative. Com­posed of leading green building experts and thought leaders, the Institute is premised on the belief that providing a compelling vision for the future is a fundamental requirement for reconciling humanity’s relationship with the natural world. The Institute runs the Living Building Challenge, Living Community Challenge, Living Product Challenge, Net Zero Energy Certification, the Cascadia Green Building Coun­cil, Ecotone Publishing, Declare, JUST and other leading-edge programs. A global network of more than 450 volunteers across nearly 42 countries drive the local adoption of restorative principles in their com­munities. This entry was posted in Feature, Most Popular, News, Sustainability and tagged Garden Tower Project, Living Product, Living Product certification, living product challenge.